Soon after our last update, the rebels of the Free Syrian Army announced the capture of Salqin in the northwestern province of Idlib. This was the first step in a push to close the Syrian government's last pocket of control along the Turkish border in Idlib - a goal reached just this Tuesday when the rebels finally stormed the loyalist border town of Harem. This leaves Idlib city and the town of Jisr al-Shughur as the Syrian army's last major strongholds in the northern part of the province. Meanwhile, rebel groups have extended their control further into Al-Raqqah and Al-Hasakah provinces in Syria's northeast. On November 8th, they reached the Kurd-dominated town of Serekani (known in Arabic as Ras al-Ayn), where they pushed out what government soldiers still remained after a Kurdish takeover earlier this year. However, this victory was followed by several weeks of clashes between the rebels and local Kurdish militias. Much of the fighting was initiated by Islamic extremist factions among the rebels, though relations are already tense enough between Kurdish groups and the Arab-dominated Free Syrian Army. Kurdish militia units took the events in Serekani as a cue to finish ridding other Kurdish towns of government troops, some of whom had previously been allowed to remain inside their bases despite no longer controlling the towns. These efforts also resulted in one new town, Tal Tamir, falling into Kurdish hands. Also in the country's northeast, rebel forces overran Tishrin Dam on the Euphrates River in late November. This hydro-electric dam is an important source of energy for northern Syria, and also serves as a key crossing on the main road from Aleppo to Al-Raqqah. 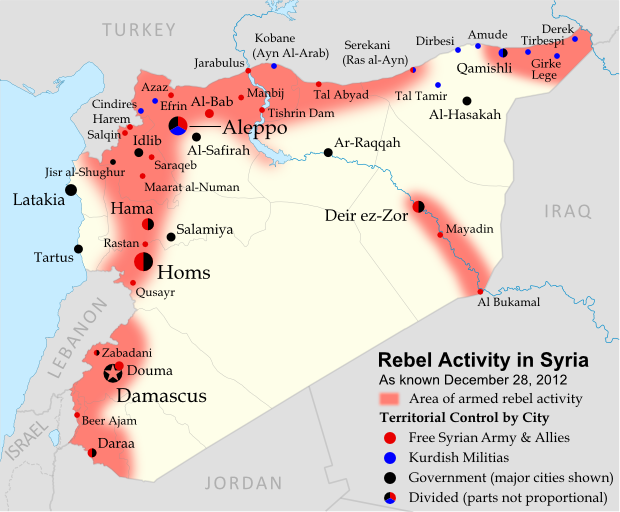 Although the Syrian capital itself remains mostly under government control, rebel activity in the surrounding suburbs has redoubled in recent months, with neighborhoods outside the city limits believed to form a patchwork of government, rebel, and undetermined control. Douma, the next largest city in Damascus's metropolitan area, is again a rebel stronghold. Farther to the southwest, fighting has broken out in the Golan Heights region. Most of this disputed territory has been controlled by Israel since 1967, but a thin strip on the Syrian side is patrolled as a demilitarized zone by U.N. peacekeeping forces. However, last month Syrian rebels began establishing themselves in the zone, capturing local villages such as Beer Ajam. Government forces ignored the strip's demilitarized status and entered with tanks to combat the rebels, leading to exchanges of fire with the Israeli military after Syrian shells flew over the international border.